Christian I Prinz von Anhalt-Bernburg was born on 11 May 1568. He was the son of Joachim Ernst Prinz von Anhalt-Zerbst and Agnes Gräfin von Barby-Muhlingen. 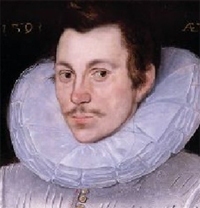 He married Anna Gräfin von Bentheim-Tecklenburg in 1595. He died on 17 April 1630 at age 61. He succeeded as the Prinz von Anhalt in 1586. He was created Prinz von Anhalt-Bernburg in 1603. Anna Gräfin von Bentheim-Tecklenburg was born in 1579. She married Christian I Prinz von Anhalt-Bernburg, son of Joachim Ernst Prinz von Anhalt-Zerbst and Agnes Gräfin von Barby-Muhlingen, in 1595. She died in 1624. [S6] G.E. Cokayne; with Vicary Gibbs, H.A. Doubleday, Geoffrey H. White, Duncan Warrand and Lord Howard de Walden, editors, The Complete Peerage of England, Scotland, Ireland, Great Britain and the United Kingdom, Extant, Extinct or Dormant, new ed., 13 volumes in 14 (1910-1959; reprint in 6 volumes, Gloucester, U.K.: Alan Sutton Publishing, 2000), volume I, page 271. Hereinafter cited as The Complete Peerage. [S18] Matthew H.C.G., editor, Dictionary of National Biography on CD-ROM (Oxford, U.K.: Oxford University Press, 1995), reference "Ashburnham, John, 1603-1671". Hereinafter cited as Dictionary of National Biography.